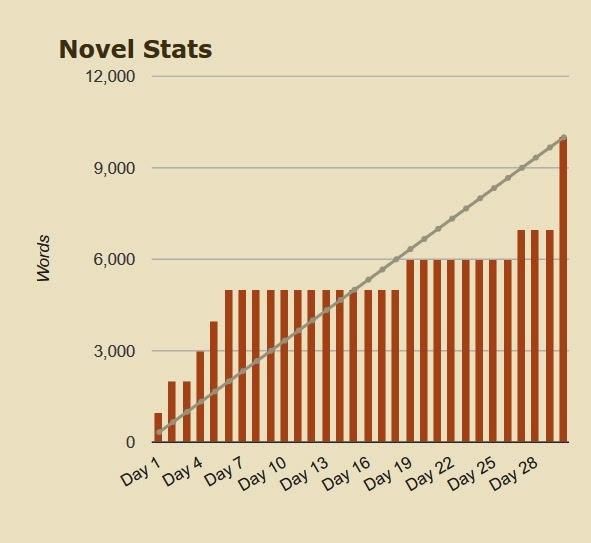 This year's first Camp NaNoWriMo (there's another session in July) was a bit rough, but I probably should have expected that, considering I hadn't touched my novel since November 30th -- after writing the last 10,000 words on the last day of NaNo '13. As you can see, my graph looks a bit like my graph from NaNo '13, with lots of progress all on the last day. The first week or so I look like I was very ahead because originally I was aiming for 30k. Then tax returns had to be done, and then some things happened in my personal life, and somewhere around Day 23, I realized I was never going to reach 30k. I revised my word count goal down to 10k, which still forced me to work on the novel before the month ended, but also allowed me recognition for the small victory of getting back to work on a project that had gone cold -- not an easy task, as many of you probably know. I really like the flexibility of the summer sessions of Camp NaNoWriMo (as opposed to the original NaNoWriMo, which takes place in November). Last summer they started allowing us to set our own word count goals, which is fantastic for those of us who are really busy in the summer or just want to use Camp NaNo for a little bump, rather than the whole 50k. You can also specify whether you're working on a novel or another project, but for me that isn't as helpful because I've always just done whatever kind of project I want anyway -- whether it's finishing a novel I've already started, or working on revisions. I'm hoping that eventually they'll give us the ability to track our work in terms other than word count if we want -- such as pages -- as that would be nice when I am working on revisions (as I likely will be in July). Since I didn't get as far with my novel as I wanted in April -- my original plan had been to finish writing, but working on creating a timeline and reading over the novel to refamiliarize myself with it turned into doing revisions to what I wrote in November -- I will be working on it more in May. My new goal is to finish revisions in May, and finish writing the novel in June. That will hopefully free me up to get back to work on the revisions to my first Ruby Ransome novel during the July session of Camp NaNoWriMo. I do love having another session of Camp NaNoWriMo to look forward to, not to mention the incentive to help me keep my writing on track. Fingers crossed for a fun and productive summer!